Most people have heard that breast cancer can occur in young women, those in their 20s or 30s, or even younger. Yet if you happen to be that young woman, you might feel very alone. Breast cancer isn’t supposed to happen when you are at an age when you have young children or are just beginning to think about having children. Not only does breast cancer come as a shock to many young women, but breast cancer at a young age opens a plethora of issues that aren’t faced by women who are older. These issues range from fertility to coping with premature menopause, to coping with the late effects of the disease that may take decades to appear. On top of this, breast cancer can be a very different disease in young women. We are learning that many of these cancers differ biologically from those found in older women. This translates to differences in everything from treatments to prognosis. Let's talk about the ways in which living with breast cancer is different for young women than older women, the unique issues younger women face, and how you can find support as a young woman with breast cancer. In talking about breast cancer in young women, it's helpful to first define who we are talking about. The definition of "young women" with breast cancer varies by the study or discussion. Many studies talk of women that are aged 40 and under, whereas others talk about women who are under the age of 35. Still others refer to any women who are pre-menopausal at the time of diagnosis, with the average age of menopause being 51. Amidst all of the pink ribbons, many people believe women with breast cancer get tremendous support. Unfortunately, however, there are many needs that are still unmet for women living with breast cancer, especially those who are young or have metastatic breast cancer. At the current time, roughly a third of women are diagnosed with breast cancer prior to menopause, and 7 percent of breast cancers are diagnosed before the age of 40. Only around 1 percent of breast cancers, however, occur before the age of 30. Of cancers that occur in women between the age of 15 and 39, breast cancer accounts for around 40 percent of these. In numbers, around 25,000 women under the age of 45 are diagnosed with breast cancer each year, and 2,500 will die. Age of breast cancer diagnosis also varies by race. Whereas white women carry a higher risk of breast cancer than black women in the post-menopausal period, breast cancer in black women is twice as common as in whites among those 35 and under, and these women are three times as likely to die from the disease. One of the heart-breaking aspects of breast cancer in young women is that it is sometimes associated with pregnancy. Breast cancer occurs in around 1 in 3000 pregnancies, and pregnancy-associated breast cancer (cancer during pregnancy and the year or two following pregnancy) accounts for around 7 percent of breast cancers in young women. The association of breast cancer with pregnancy is confusing, as the effect of pregnancy on the risk of breast cancer is different depending on age. We know that having children earlier in life, and having more children, is associated with a lower risk of developing breast cancer later on. In contrast, having children earlier and having more children is associated with an increased risk of breast cancer in the young, due to the elevation in breast cancer risk following pregnancy. In other words, pregnancy results in an increased risk of breast cancer for the first several years following delivery, but is associated with a lower risk of the disease later on. There are many ways in which breast cancer is different in young women than older women. Let's take a look at the differences in symptoms and diagnosis, how breast cancers are biologically different, and how the treatments and prognosis for the disease differ. Around four out of five young women with breast cancer are diagnosed after they find a breast lump. In contrast, breast cancer in older women is often found on a mammogram. Even when younger women do have mammograms, these studies are less accurate due to the increased breast density in younger women. The diagnosis of breast cancer is made in 80 percent of young women after they find a breast lump. For this reason, the diagnosis of breast cancer is often made at a higher stage in younger women. The diagnosis of breast cancer may also be difficult for young women who are pregnant or breastfeeding as breast changes are often considered normal at first. Young women with breast cancer are more likely to have a genetic predisposition to the disease. Women under the age of 35 are much more likely to have other family members with breast cancer than older women. In one study, roughly half of women who were diagnosed before the age of 30 and had a family history of breast cancer had BRCA1, BRCA2, or TP53 mutations versus only 10 percent of women who did not have a family history. People with Cowden syndrome (PTEN mutations) also have an increased risk for early age breast cancer. Recent birth control use - The recent use of oral contraceptives raised the risk of breast cancer in young women by a factor of two. In contrast, high vitamin D levels have been associated with a lower risk of premenopausal breast cancer, as have intense physical activity and a high intake of fruits and vegetables. There are significant biological differences (molecular characteristics) between breast cancer found in younger versus older women. HER2 Positive vs. HER2 Negative Breast Cancer: Which is Better? Premenopausal breast cancers are also more likely to have a higher tumor grade (for example, are more likely to be grade 3 than grade 1 or 2). Tumor grade is a measure of the aggressiveness of a tumor, so tumors in young women tend to be more aggressive. Triple negative breast cancer, the most difficult breast cancer to treat, is also more common in young women. In one study, 56 percent of black and 42 percent of white women between the ages of 20 and 34 had triple negative tumors. The treatment options for breast cancer in young women can differ from those in older women in some important ways, not only because the molecular characteristics (for example, estrogen positive versus estrogen receptor negative) differ, but also because of menopausal status and the risk of long-term complications. One of the decisions women with early stage breast cancer make is choosing between a lumpectomy and a mastectomy. While decision making in this realm is difficult enough for those who are postmenopausal, it can be terribly confusing for young women. Breast-conserving surgery such as a lumpectomy carries less emotional impact for young women, but at the same time, young women are at a greater risk for recurrence (which is higher with a lumpectomy than a mastectomy). This is a decision that requires careful contemplation for anyone, especially young women. The decision about having a bilateral mastectomy also becomes more important, as the risk of contralateral breast cancer (developing cancer in the other breast) is fairly common. Women who are treated for early stage breast cancer under the age of 36 have a 13 percent chance of developing cancer in the other breast during the following 10 years. Compared to older women, younger women are more likely to have a recurrence, and adjuvant chemotherapy (chemo after surgery) can decrease this risk. At the same time, however, side effects including premature menopause and more (discussed below) can be more severe for young women, and long term side effects play a larger role. As noted above, young women are less likely than older women to have estrogen receptor positive tumors reducing the chances that hormone therapy for breast cancer will be effective in young women. For young women who do have estrogen receptor positive tumors, tamoxifen is usually needed instead of an aromatase inhibitor. We are learning that treatment with an aromatase inhibitor for 5 years (and probably for at least 10) can significantly reduce local recurrences and that this treatment may be more effective than tamoxifen. Unfortunately, aromatase inhibitors can only be used for postmenopausal women. For this reason, younger women often have to consider ovarian suppression therapy. Removal of the ovaries (oophorectomy) or more commonly, treatment with drugs that suppress ovarian function are effective. On a positive note since HER2 positive tumors are slightly more common in young women, three are now several HER2 targeted therapies (such as Herceptin) available. With the approval of these therapies, the National Cancer Institute upgraded their prognosis for stage I to stage III HER2 positive breast cancer from fair to good. Radiation therapy can be effective for young women as well. The long-term side effects of radiation therapy, however, become more of an issue. Long-term side effects of chemotherapy such as peripheral neuropathy and premature menopause can lead to other medical conditions. The combination of chemotherapy and especially aromatase inhibitors can result in low bone density, osteoporosis, and fractures. A discussion about bone density is particularly important for young women with the disease. Long-term side effects of radiation therapy include the risk of secondary cancers—cancers that develop due to the carcinogenic effect of radiation. Women under the age of 50 with breast cancer have a significantly higher risk of secondary cancers including cancers of the bone, ovary, thyroid, kidney, lung, leukemia and lymphoma. Unfortunately, the survival rate for young women with breast cancer is lower than that for older women with the disease. In a large study of over 200,000 women with breast cancer, women less than 40 are 39 percent more likely to die from their disease. Not only is survival lower, but the improvement in survival rate since 1975 is less than that of older women with the disease. Part of this disparity is that we do not have a screening test to detect breast cancer early in young women and as noted, the condition is diagnosed in most young women after finding a breast lump. There are other factors as well. When breast cancer recurs in younger women it is more likely to be a metastatic recurrence than a local recurrence. On a positive note, however, young women do have some advantages. Young women tend to be healthier with fewer other medical conditions. In addition, young women can often better tolerate treatments. In the past, it was thought that pregnancy-associated breast cancer (breast cancer which develops during pregnancy and in the 5 years following pregnancy) was associated with a poor prognosis. A 2013 study found that women with pregnancy-associated breast cancer had a significantly lower overall survival rate. A 2016 study, in contrast, found that these cancers had a higher risk of local recurrence but did not differ in overall survival rates from non-pregnancy-associated cancers. Both wondering if you will be able to get pregnant, and wondering how to prevent getting pregnant are large concerns for young women with breast cancer. Chemotherapy is well known for throwing a woman smack into menopause, and ovarian suppression therapy may be added as well. For those who want to have kids in the future, there are options for preserving your fertility. Unlike freezing sperm, freezing eggs is still an investigational procedure. That said, freezing embryos is commonly done. Learn more about how breast cancer affects fertility and what your options are for preserving your fertility. The flip side of this concern is that some people remain fertile even during treatment. For those who have used oral contraceptives, these are no longer an option due to the estrogen in the pills. Other methods of contraception such as condoms or an IUD are instead recommended. Menopausal symptoms can be extremely annoying for young women being treated for breast cancer. Rather than the typical gradual onset of hot flashes typical of menopause, these symptoms can come on seemingly instantly after chemotherapy begins. Sexual side effects are common with lower estrogen levels, and these can be particularly bothersome for young women. Talk to your doctor if you are experiencing any of these symptoms. Fortunately, this aspect of life quality is being addressed much more often by oncologists, and there are many options for help. You may also wish to take moment to check out some ideas on nurturing your sexuality during cancer treatment. Coping as a young mother (or father) with breast cancer is one of the many differences between support needs in young women versus older women with breast cancer. The lovely self-care brochures which depict women relaxing in a chair and listening to soothing music after chemotherapy may seem entirely fictional if you have toddlers running around using the couch you are sitting on for gymnastics practice. Being involved in a breast cancer community with other young mothers can be valuable, and may give you many ideas. It's also important to reach out to your family and friends and ask for help. It's easy to forget the busyness of a household with young children when your children are old enough to take care of themselves. Describing a typical day for you may serve as a reminder to older moms you know, motivating them to step in and help as they recall the challenges of young motherhood even without breast cancer. Coping with the emotions of breast cancer is difficult for anyone of any age. Yet those who are young have an increased risk of both severe anxiety and depression. At the same time that these emotions occur, having the time to address them may seem overwhelming. Talking with a cancer therapist can be very helpful and has been correlated with improved survival rates for people with breast cancer. Many people mistakenly believe that there is ample support for women coping with breast cancer, yet this is untrue, especially for those who have "less common" circumstances, such as those who are young. What types of support are available? Support groups and communities can make a tremendous difference for women (and men) with breast cancer. A caveat, however, is that it's helpful to find a group made up of other young women. The issues you are facing as a young woman are considerably different from those a woman of 60 or 70 may be facing. Women who are grandmothers don't generally share the same concern about the middle of the night feedings during chemotherapy or whether or not it is wise to become pregnant after treatment. 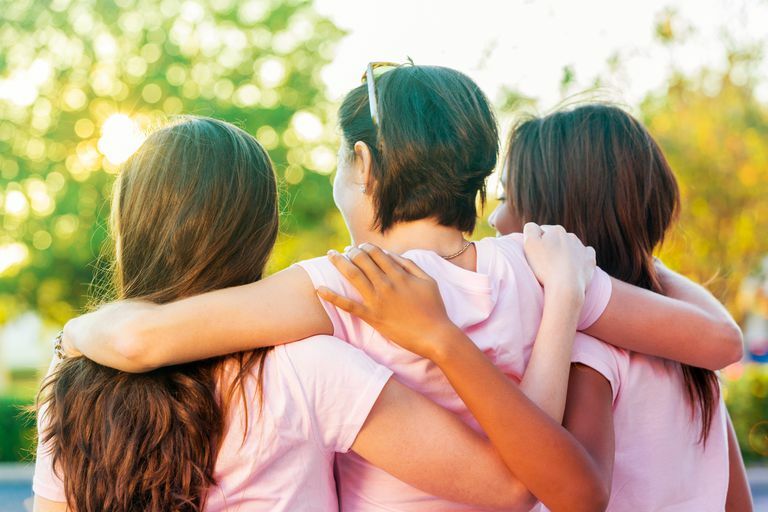 Fortunately, there are many support groups and online communities designed specifically for young women with breast cancer. It can be somewhat challenging finding these groups, but this has been made easier now with hashtags. If you are on Twitter or Facebook and are searching for these groups, use the hashtag #BCSM which stands for breast cancer social media. Before doing so, however, take a moment to learn about how to share your cancer journey safely through social media. A diagnosis of breast cancer as a young woman presents issues that may not be present for older women with the disease. In many ways, breast cancer is a different disease in young women, which translates to different treatments and a different prognosis. There are many unique issues for young women as well, ranging from fertility concerns to the long-term risks related to the treatments for the disease. Careful decision making is imperative for every woman with breast cancer, and weighing the options can be even more difficult. Aggressive treatment is often recommended due to the greater risk of recurrence, but this also means late effects of cancer treatment may be greater than that for older women. We are learning that decision-making strategies are underutilized when making these important decisions, and young women need to be equipped with the latest scientific data to make the best choice for their own care. As a final note, it's important to point out that there are silver linings to developing breast cancer at a young age. Despite the emotional impact and side effects of treatment, studies are telling us that cancer changes people in positive ways as well. Those who have faced cancer tend to be more compassionate and empathetic, have a greater sense of gratitude for life, and live healthier lifestyles than those whose lives have not been invaded by cancer. How Long Can You Wait to Have Surgery for Breast Cancer?